When the talk about violence in our country shifts to talk about violence in our movies, it feels like the wrong tack to take, sliding away from real issues and real solutions to something more in the air about living in a violent culture and what that means. The latter is very hard to quantify. The former, well, it should be obvious. Maybe things will be changing. I hope that they are. The Hunger Games (the film version). In what world should that have been a PG-13? In what world did they get away with a PG-13? The film product of the bestselling series was squarely aimed at tweens, and as a result, the film was worse than it could’ve been. I know parents who freaked out about the fact that their 11 year old kids were invited to this film for a birthday party. There’s something craven and gross about aiming this kind of blanded-down edgy content right at kids. The fight scenes in the games were disturbing. Instead of showing kids-killing-kids and making the audience feel it, viscerally, there was blurry shaky-cam, where you the audience member couldn’t figure out what was going on. Consequently, to me, it felt like the deaths were marginalized and of little importance. If the movie had been R, on the other hand, the director would’ve had more leeway to linger on the gore, the violence, what it meant and what it means. It could’ve been horrifying. It probably should’ve been! The Hunger Games wasn’t great - Jennifer Lawrence’s soulfulness made it seem like a better film than it was, but like the Twilight films, it was a workmanlike adaptation of a bestseller with the blandest possible choices, when the secret of The Hunger Games is that it’s dealing with issues, choices, morality and ethics. But all those questions are under the cover of ultraviolence presented as bread and circuses. Sometimes I wonder what it would do to brains if every time somebody was punched or shot-at in a film, if you the audience felt it and understood it as something bad, painful, a snuffing-out of life force. 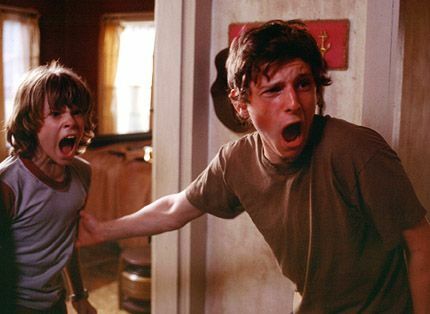 I remember watching the David Gordon Green film Undertow in the theater - there’s a fight scene early on, the sort of fight scene where you’re cringing because it’s ugly and surprising and you actually believe in the hurt. Shockingly, that scene stands out for me, it stands out in my mind because it’s so different. It’s … feeling everything, perhaps, to quote Fiona Apple. Compared to that scene, every other movie is just a nihilistic exercise in style. Whether it’s rotting our little brains, who knows? But there is something to be said for doing work that wants to illuminate what it’s like to be human (hey, like Mike White and Laura Dern’s Enlightened!) and just doing something that’s saying, look at me, look at this action, feel nothing. I want to feel everything.